The arrival of a first winter male Long-tailed Duck at Gwithian Local Nature Reserve has provided an exceptional opportunity for Cornish birders to photograph and compare this bird with the adult male Long-tailed Duck still only a few miles away at Hayle, the subject of the previous post. The young male is on the large pool at Gwithian, close to Godrevy point on the north coast and can often be seen feeding close to the fenced off public path providing exceptional opportunities for bird photographers. In fact, when I was there, it would often come so close to the edge of the pool that it couldn’t be seen over the raised bank. The chances of both male Long-tailed Duck being present in Cornwall at the same time, within a few miles of one another and at locations where they can be photographed by even those photographers without long lenses must be a rare event. 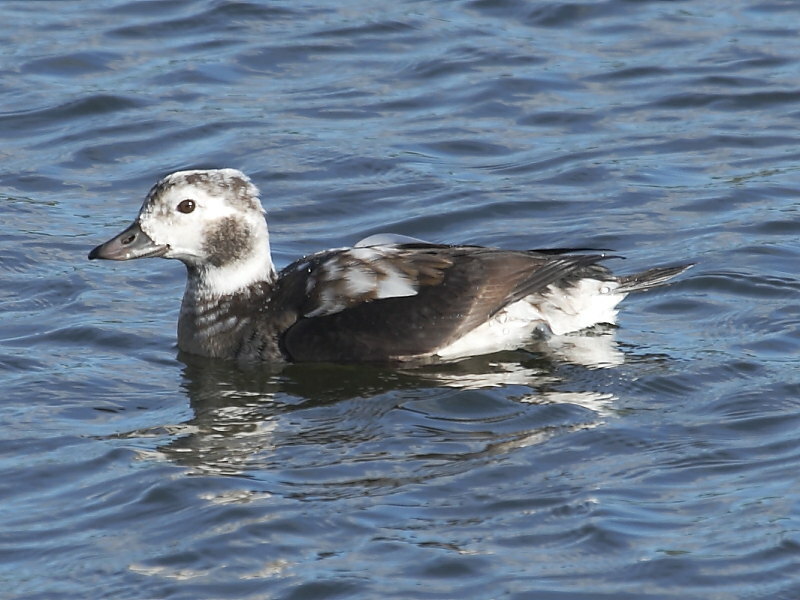 From an identification point of view the dark cheek smudge stood out on this first winter male Long-tailed Duck as it did on the adult male but the bill lacked the pink band and the extended tail feathers were absent. Over all, in comparison to the more mature male, it came across as being generally darker with less contrasting black and white plumage but nevertheless an easily identifiable species, even at distance.